Boston Society of Film Critics Awards: Best Actress, Best Supporting Actor, Best Screenplay. Academy Award Nominations: Best Actress, Best Supporting Actor, Best Adapted Screenplay. 45 other wins, 83 other nominations. Based on a true story, “Can You Ever Forgive Me?” stars Academy Award nominee Melissa McCarthy as Lee Israel, the late biographer and forger whose brilliant tale of deception speaks volumes about our obsessions with celebrity and authenticity. Sliding into middle age with no other skills to fall back on, Lee lights upon a fresh method of capitalizing on the public’s fascination with fame. Teaming up with an old acquaintance (a charming Richard E. Grant) freshly released from prison after serving time for armed robbery, Lee begins selling the stolen and/or forged correspondence of dead writers and actors. The gig is a success but success has a way of drawing unwanted attention. 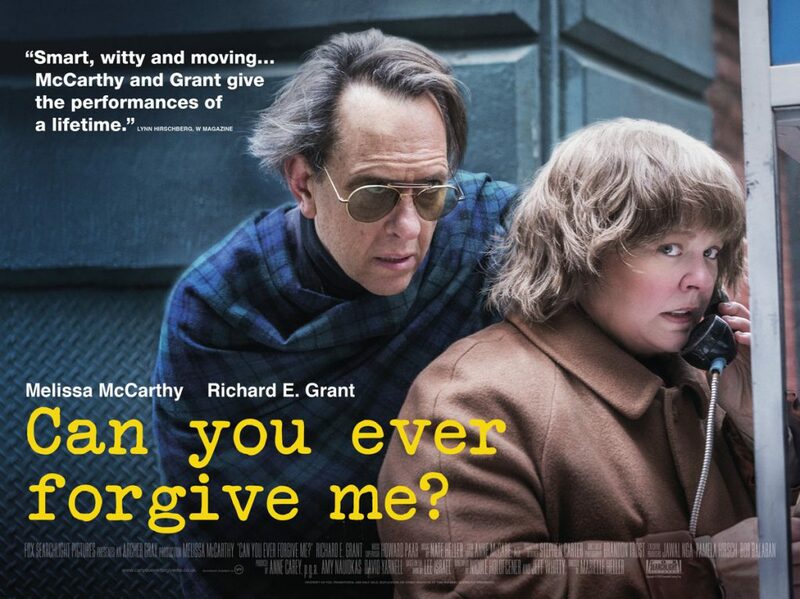 Adapted from Israel’s eponymous memoir by Tony Award-winning playwright Jeff Whitty (“Avenue Q”) and writer-director Nicole Holofcener (“The Land of Steady Habits”), “Can You Ever Forgive Me?” is an incisive comment about commodification, legitimacy, and opportunities for women. McCarthy seizes the opportunity to expand her already-impressive repertoire: her performance here brims with intelligence, acerbic wit, and an alluring sense of mischief.